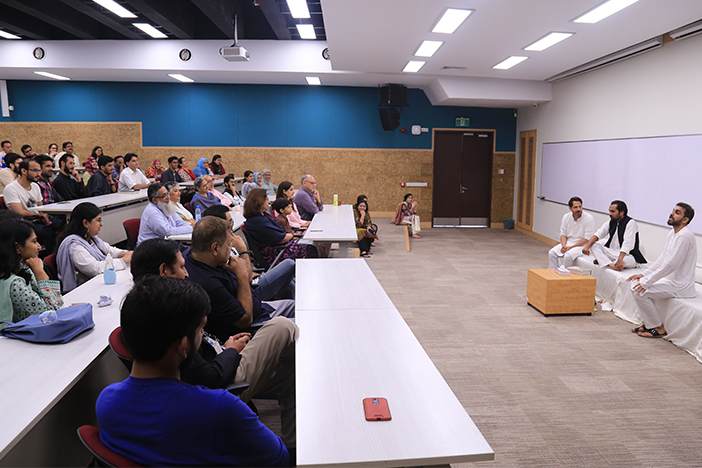 On the 17th of August 2018, the Habib University Library and Information Commons, in collaboration with the Arzu Centre for Regional Languages and Humanities, hosted an event in memory of the late Pakistani writer Mushtaq Ahmad Yousufi. Mushtaq Ahmed Yousufi was a legendary writer of Urdu satire, a renowned humorist who made giant contributions to Urdu literature and to comedic writing in the form of books and articles (for which he was awarded the two highest literary awards, Sitara-i-Imtiaz and Hilal-i-Imtiaz by the Pakistani government). Originally a banker by profession, Mushtaq Ahmad Yousufi achieved literary fame, and was highly praised by the likes of Ibn-e-Insha, Dr Zaheer Fatehpuri, Zehra Nigah and Iftikhar Arif, to name just a few. The celebrated satirist passed away after a protracted illness in Karachi in June 2018, at the age of 94. 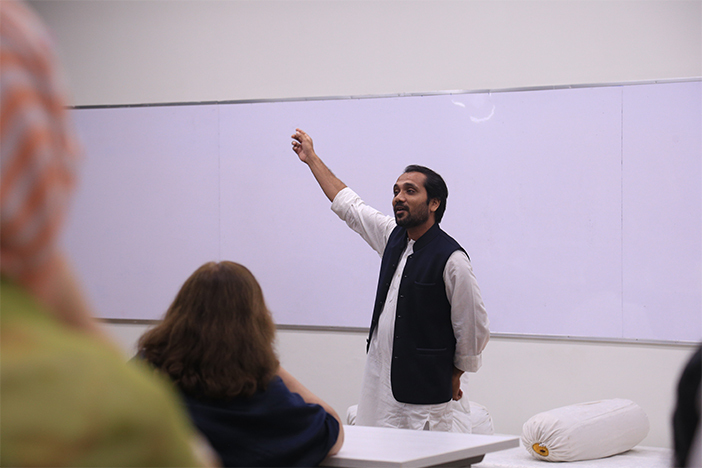 After an introduction to the event by the library staff and Dr. Asif Aslam Farrukhi, an Associate Professor of the School of Arts, Humanities, and Social Sciences at Habib University, the event began. 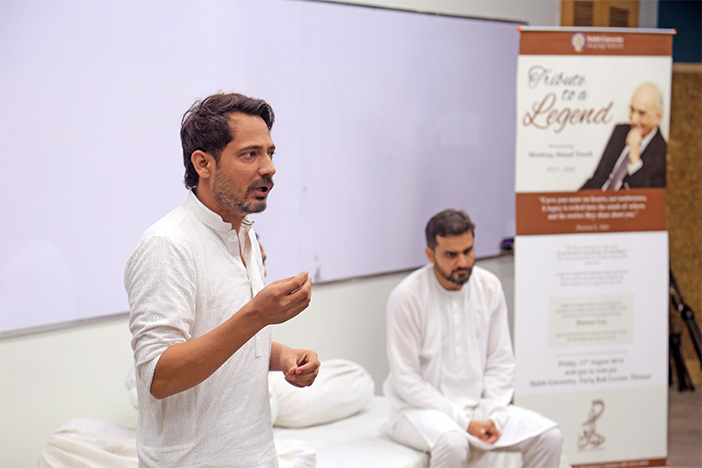 It was a Dastangoi performance of an extract of one of his works – Haveli. Dastangoi is a form of oral storytelling, its chief characteristic being the performer’s enthusiasm and passion that is intentioned to bring to life the story being told. It is a revived form of expression that had been, until recently, forgotten. The extract from Haveli, orated by the performers was about a man named Qibla. Qibla had a notable personality, being a man of strict principles and a violent nature. The story is full of amusing encounters Qibla has with his relatives and the customers at his wood shop. However, the story takes a more serious turn towards the end, where the topic of partition is highlighted. Qibla is known to keep a photograph of his old haveli to show to people. The story then goes on to show his financial difficulties that arose due to his migration. The story also highlights a contrast in his behavior – between how towards his wife he is a loving husband but with other acquaintances, a short-tempered man. The memorial event was packed full by students and literary lovers alike. The performers received a standing ovation after the Dastangoi concluded. While the country rightfully mourns the loss of this great literary legend, we also celebrate the works of Mushtaq Ahmad Yousufi that will live on forever.